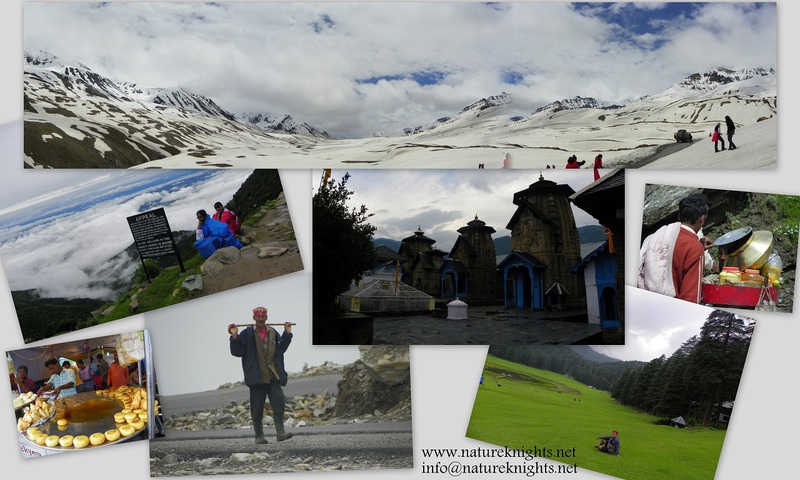 Himachal Special - 14 Nights and 15 Days (Family Holiday) Summer 2011 Special. 1st Day- Pick up from Katra,Jammu or Pathankot to Dalhousie night stay. 2nd Day- Dalhousie to Chamba, Khajjiar, Jot and on the way sight seen back night stay Dalhousie. 3rd Day- Dalhousie to local sight seen night stay Dharmshalla. 4th Day- Dharamshalla to local sight seen Vaksi Nag Temple, Maglode Ganj Market,Dalai Lama Temple, Waterfall& back night stay at Dharmshalla. 5th Day- Dharmshalla to Chamundaji Temple, Kangra ji Temple, Jwalaji Temple and night stay Jwalaji. 6th Day- Jwalaji to Naina Devi Temple,Nangal dam sight seen and Chintpurni Temple night stay Jwalaji. 7th Day- Jwalaji via Palampur(tea wagon) Baijnath Temple, night stay Mandi. 8th Day- Mandi to on the way sight seen Vaishnavi Temple, Dam sight, Kullu Market & night stay Manikaran. 9th Day- Manikaran to local sight seen & via Kullu night stay Manali. 10th Day- Manali to Gulaba valley, Mudi Valley, Rohtang pass & back night stay Manali. 11th Day- Manali to Bashisht Temple, Solang Valley (Para galaiding point and Snow Riding Snow Bike) night stay Manali. 12th Day- Manali to local sight seen Manu Temple, Hadimba Temple, House Club, Rope way river crossing, NAC market, Tibetan market and night stay Manali. 13th Day- Manali to on the way sight seen night stay Shimla. 14th Day- Shimla to Mal Road Market, Kufri (Snow point) back night stay Shimla. 15th Day- Shimla to Kalika or Chandigarh drop.